after almost two years of reading rapturous reviews, I finally ate dinner here last night. To say my expectations were high is a major understatement. 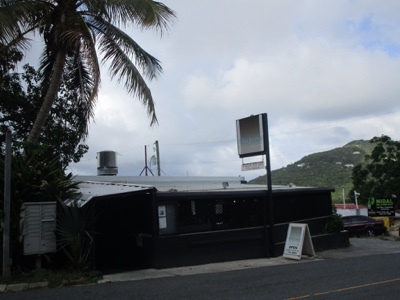 The bartender, Mary, could not have been more friendly and attentive. Explaining the difference between the Bar Menu and Restaurant Menu to us took patience, but I think we finally got it. I opted to indulge in one of their many inventive cocktails - the 'Spicy Prickly' Martini $13 made with Jalapeno-Infused Vodka (hot! 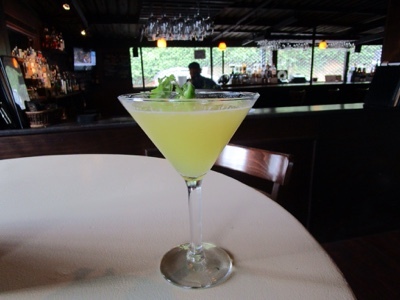 ), Cruzan Pinapple Rum, Sour Mix, Fresh Lime and Cilantro. Nice and strong! 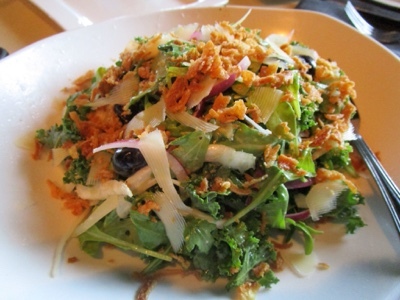 My 'Leafy Greens' Salad - Arugula, Shaved Fennel, Kale, Red Onion, Parmesan, Pickled Blueberries, Onion Crunchies and Lemoncello Vinaigrette. I asked them to leave off the parmesan, but they didnt do it, so that was a bummer. Tasty Salad anyway and a good value for $14. The Mr. said his 'Garlic Chili Edamame with Togarashi Sprinkles' $7 was overcooked. Didnt even eat it all, which is unusual for him, he loves Edamame. 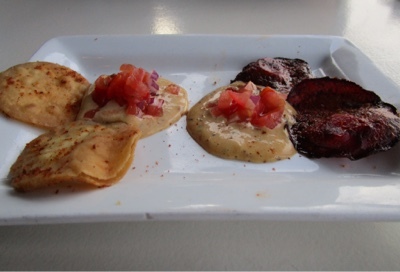 While waiting for our mains, they sent out a little treat - Tortilla Chips and Beet Chips with Smoked Tomato Aoli. I can only vouch for the Chips which were good. 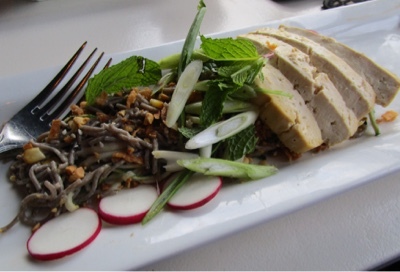 My main 'Sesame Tofu' $26 Soba Zucchini Noodle Salad, Miso Vinaigrette, Cilantro, Smoked Corn, Radish and Peanuts was completely meh. Hardly any seasoning on the Tofu, overcooked Soba, six bland Radish Slices for color. This is not a dish I can recommend, possibly wasnt even vegan, fortunately there wasnt much of it. also wasnt expecting to be looking at this apartment building from our table, another one of my assumptions was that the restaurant had an unobstructed view of the water. So in summation: while my expectations for dining at Thirteen werent quite met, I will continue to carry out their cheeseless Veg Head Pizza because that has always been stellar. 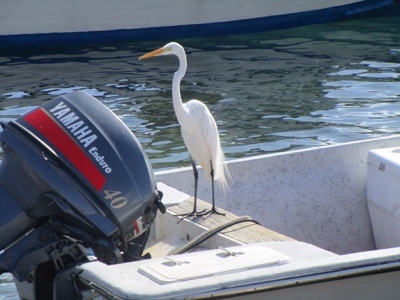 Completely unrelated, an Egret on a motorboat in Frenchtown. Thanks for looking. Bye for now. Wow, what a disappointment. At least the drink and the salad minus the Parmesan were good. Poor kitties. I don't like seeing them by all that broken wood. I have a habit of getting my hopes up too high sometimes. It is a pity about the cats. Not sure what can be done without approaching the people in the apartment building about them. The martini and salad look like the best part (too bad about the parm! Hopefully you could pick it out or avoid it without sacrificing much else of the salad!). 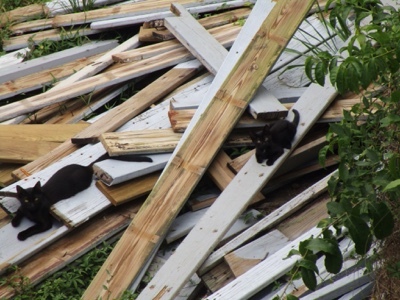 I hope those kitties have someone in the hood who leaves out food and water! :( I have an acquaintance who had a cat that loved to wander around her neighborhood, and one day he didn't come home. She said she wasn't worried about it. It has been two years, and she still isn't bothered. I can't understand it!! There are so many strays on the Island, it is heartbreaking. Fortunately, there are some people who work really hard to trap, spay/neuter and find homes for these angels. They have to fly them to the mainland, that is how many homeless animals are here. (Your acquaintance sounds irritating). How disappointing! I bet that salad would have been delicious if they didn't put the cheese on it. I guess at least the drink and service were good. 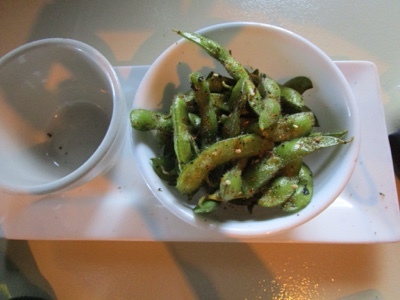 I can't believe they messed up edamame. I feel like it's hard to mess that up. Poor cats. I wish there was a way to make sure that they had some care (like food and water as Ingrid mentioned). Really sad to see that. I'm sorry the experience was disappointing. Hopefully the next place you try out will make up for it. 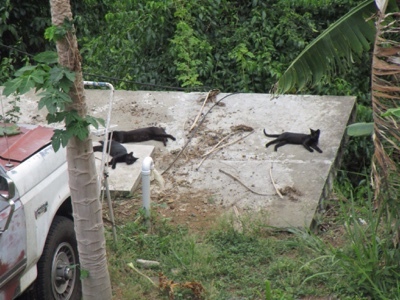 I am concerned about the cats but am afraid to walk behind the restaurant onto private property to inquire about them. Wont even open up my mouth about unwanted cheese on my Salad. I have zero tolerance for restaurants who don't take food restrictions seriously. I'm not in the habit of sending things back, but that would have gone for sure. The problem with non-vegan restaurants offering crappy vegan options is that a non-vegan might try it and think, "Yup; I knew it would be terrible." So infuriating all around. Yeah, on the one hand, it was cool the vegan option wasnt a Portobello Mushroom or Pasta Primavera, but even I could come up with a tastier version of Tofu with Soba. Very strange for such a nice restaurant. Maybe it was an off night, but I aint risking it again. Ugh! With that drink it sounded so promising. How annoying they couldn't manage to leave off the parm on the salad, looks like it was a really good one. But seriously how can you screw up edamame?? The entree sounds good on paper but obviously they don't know what they're doing. And for $26?? Uh, no. You should seriously make an account on trip advisor to warn people! TA is weird, there are some truly horrifying terrible restaurants in the top spots for nyc so i generally don't trust it. Yeah, the drink was excellent. $26 for Tofu and Soba is insanity, but I guess it wouldnt look right for them to have a $10 dish on the menu. TripAdvisor is super important here, nobody cares about Yelp! And, yes, the number one and number two restaurants are more of an experience than great food. 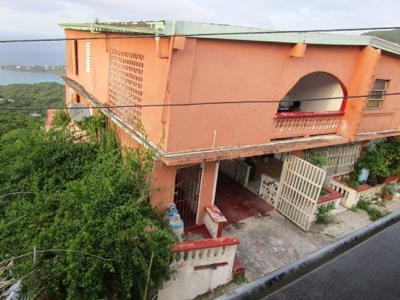 I have a TA account, but havent reviewed anything on Island. Booking Buddy is the #1 travel search engine, that you can use to compare travel deals from the large travel booking agencies. Easy Meals and Kitty Cuddles!